London's longest serving black cab driver has been honoured with an award after 70 years of service. Alfred Collins, aged 92, was given the award from Transport for London at a specially organised ceremony at the Public Carriage Office. 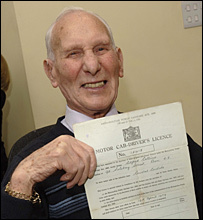 Mr Collins, from Colindale in north west London, drove his first passenger in 1937 and his last a few years ago. Some of his most famous fares have included Margaret Thatcher, Joan Collins and Bruce Forsyth. The father of two said: "Life is all about communication and I have enjoyed sharing my vast experience of life as well as learning a lot with some of my passengers. "I will treasure these memories for the rest of my life." He added: "It has been a great privilege to serve the people of London. "It really does not seem that nearly 70 years has passed by. I have had the pleasure of meeting people from all walks of life, politicians, celebrities and the great British public". David Brown from TfL said: "We are proud of the invaluable contribution he has made to Londoners and visitors alike who value the black taxi as an iconic landmark." Mr Collins said the secret to a long life was not to worry and always take a little exercise.